(from wierszewmetrze) TOMMY OLOFSSON (b. 1950) is a Swedish poet, writer and deals with theory of literature. His doctoral thesis, received in Lund in 1981, is a comparative stadium of James Joyce’s A Portrait of the Artist as a Young Man and Martin Birck's Youth by Hjalmar Söderberg. He worked as a literary critic in the Svenska Dagbladet, He is an expert in the field of style in a New Bible’s translation in the Biblical Commission. Since 2000 he has been an academic lecturer. Olofsson is an author of several books on literature and poetry collections. 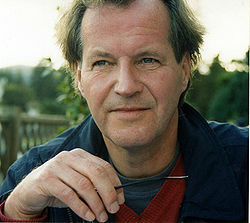 He was awarded the Tegnér literary award in 2005. Having followed an instrument maker to a Chicago slaughterhouse and stood at the end of the conveyor belt picking out pieces of bone suitable for harpsichord keys, and having subsequently grasped Emerson's transcendental points about Aquinas and his scholastic break with the accepted and (in the literal sense) metaphysical problems of the resurrection, I want to propose herewith, in ample time for the next assembly of churches, a memorandum concerning cannibals and animals. Considering that cannibals are now a dying race without sufficient access to their traditional diet, we should, as a deterrent and also for the sake of ethnological research, make life easier for the few tribes still hanging on by the skin of their teeth outside the aegis of the Church. The situation of domestic animals is less precarious, but they don't want to be turned into food and have actually never chosen to be served on our plates. Pigs are slaughtered under protest that squeals to high heaven. They want to go back to their fetid stalls and wallow in the mud and await eternal life, which by right ought to be available even to them. The pig wants to be pieced back together again, to be made whole again so he can scratch himself happy against a rouch board. And the velvet-eyed veal calves crammed in their crates dream of being granted just one glimpse of the sky's blue face. Most of all they want to live forever, exactly like us!